Buying more Made-in-the-USA goods helps burnish its image — but domestic manufacturing helps Wal-Mart’s bottom line, too. BENTONVILLE, Ark. — The group cheer at Wal-Mart’s third annual U.S. manufacturing summit — convened to find more American-made products — was greeted with a voice from another era. “Almost anything can be made by Americans, in this country, and be done efficiently,” said founder Sam Walton, in a grainy black-and-white video clip from the 1980s, explaining Wal-Mart’s new mission to buy more products at home. Ultimately, Walton failed. American factories that might have fueled the effort instead closed. Critics blamed Walmart’s insistence on low costs for driving the U.S. supply chain to China, where cheap labor overwhelmed American rivals, and the nation’s manufacturing base hollowed out. Now, Wal-Mart is trying to revive it. Two years into a ten-year plan to buy $250 billion more in products from U.S. factories, the retailer is heavily hyping its effort, which comes as it struggles with flagging sales and labor strife. Skeptics, citing the company’s history, say it’s just a glitzy PR stunt. This time, though, the retailer might break though where its founder couldn’t. Advances in technology and a rising standard of living (and thus wages) in China help. And just as Wal-Mart originally used its gargantuan scale to send supply chains overseas, it can redirect that purchasing power into hauling them back onshore, while sticking to its every-day-low-prices raison d’être. Of course, helping America make stuff again is also a way for Walmart to return to the country’s good graces. In that way, it resembles previous efforts to become more energy efficient — might as well use something that helps the bottom line to burnish your credentials as a corporate citizen. 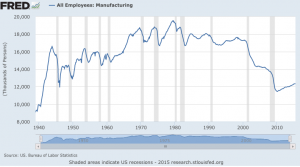 But there’s a catch: Manufacturing is different this time around. The same technology that helps factories compete eliminates the need for many workers. So while Wal-Mart could be successful in its bid to bring some production home, it’s going to have to buy a whole lot more from the U.S. than it ever did before in order to replace the jobs that have already been lost. After the speeches, Wal-Mart’s Open Call meeting for would-be suppliers began in earnest. At the company’s low-slung “home office,” narrow hallways lined with tiny rooms buzzed with people pitching their wares: Hand lotions, cooking ingredients, a grill extension used to cook pizza, a tee-ball set. In one, a black plastic owl with green-white-painted feathers sat on a table in front of a Wal-Mart buyer. Last year, a lawn and garden company called Dalen had worked with Wal-Mart’s buying team to bring back to the U.S. an owl with a rotating head — the kind used to scare pigeons away — as well as tree stakes it had been producing in China. With a purchase commitment from Walmart, sales and marketing director Nancy Taylor explained, they were able to make them at their factory in Knoxville, Tenn. This time around, she was hoping to get into a different department — holiday decorations — where almost nothing is made in America. The labor-related slowdown at the West Coast ports this past winter, which had delayed product delivery for weeks, strengthens the pitch for time-sensitive products. “I think that’s made some retailers a little more aware that they should have some kind of domestic backup,” Taylor says. Walmart didn’t buy the spooky owl on the spot, but prospects look good. Not every product was something that used to be produced overseas, however, or even something long produced in the U.S. that had just come to Wal-Mart’s attention. Much of it would appear in the grocery aisles, which the U.S. already dominates. In that category, the Open Call served as a vehicle to pressure suppliers for their lowest possible price. Take FrogFuel, a protein shot that comes in a shiny pouch. Jeff Byers, the former Navy SEAL who’s pitching it, explained in his pitch meeting that one retailer sells it for $2.50 a pop, and doesn’t think it’s charging enough. That’s part of what sets critics on edge: Much of what Wal-Mart’s counting toward its $250 billion goal for products “made, grown, or assembled” in the U.S. might have been bought anyway. $250 billion is only about five percent of Walmart’s net sales over the past decade, and could be achieved through normal growth. Wal-Mart is still by far the nation’s biggest importer, and a strong proponent of a trade deal with Asia that would allow it to import even more at lower prices. But even if they don’t have a massive volume of new U.S. sales, they do have plenty of projects that show what’s possible. Like Emilia PC, a cosmetics company that was able to buy a near-death factory in Mississippi and get bank loans to purchase productivity-boosting systems, with the help of a longer-term purchase commitment from Walmart. Or Ferrara, a candy company company that, when asked to produce more of Wal-Mart’s private-label sweets here, transferred some jobs from Mexico to Chicago. In some cases, the “Made in USA” product might cost marginally more than the imported one. Wal-Mart’s own consumer base, which used to skew lower-income, now represents more of an economic cross-section of America — potentially allowing them to offer products that are higher quality and higher cost. But the company has doubled down on its suppliers to cut prices in recent months. But usually, Walmart asks the company to stretch and deliver at the same price domestically what they would by going overseas. For some products, with smart management, economic fundamentals now support that principle. Energy costs in the U.S. are at historic lows. Extensive supply chains, with the risk of intellectual property theft, are now seen as more of a liability than an asset. Smaller, more productive machines are able to churn out inventory closer to the consumer, allowing for faster turnaround times. Most important for the American worker, though, is the part that has to do with labor costs. Average wages in China — which were 17.5 percent of U.S. wages in 2000 — are now 61 percent of U.S. wages, according to an analysis by the Boston Consulting Group. And above all, cutting-edge manufacturing technology — in which Wal-Mart has directly invested $10 million in grants — are able to cut out much of the labor that made U.S. production more expensive in the first place, closing the last of that gap. Still, if you’ve been producing overseas, it’s generally easier to keep doing what you’re doing. Big shifts, like investing in machinery and hiring more local workers, are risky and expensive. That’s where a push from Wal-Mart, which sees U.S. manufacturing as being in its long-term interest — and will almost always offer suppliers the biggest potential market — can make the difference. No matter the trends moving in the U.S.’s direction, it’s not easy to rebuild a supplier ecosystem that was dismantled as production moved overseas, From the beginning of Wal-Mart’s initiative, vendors told the company it was difficult to find certain components — ball bearings, for example, or circuit-boards — that went offshore long ago. That makes manufacturing a shopping cart or a bike helmet 100 percent in the U.S. not just difficult, but functionally impossible. Just as Walmart helped create that problem in the first place, it can use its scale to try to fix it. If factories that produce those little parts do exist, Walmart’s vendors will be be able to find them, with free access to a database that shows where suppliers are and what they can make. It’s also asking governments to help make those connections. A whole room of the Bentonville summit was given over to 30 states that had come to promote themselves as destinations for new plants, and educational sessions focused on exploiting incentive packages that states offer to compete with each other. Virginia, where Walmart is the state’s largest private sector employer, is targeting companies that already import goods for Walmart. “We’re working with them to figure out what companies that we can help them recruit to the U.S., and hopefully to Virginia,” says Mike Lehmkuhler, vice president of the Virginia Economic Development Partnership. Finally, to make the most of whatever preference Americans have for U.S-made products, Wal-Mart has put everything on a Made in America section of its Web site where suppliers can post touching videos of how their goods are produced. That’s not everything America could do to foster the regrowth of manufacturing. Some economists point out that if you’re trying to compete on price, rather than superior quality or innovation, addressing currency manipulation by trading partners like China and Japan would get the U.S. much further down the road, much faster. But it’s enough to give American manufacturing a chance. And it was enough to convince Hal Sirkin, the guy who co-authored the original Boston Consulting Group study that made the case for manufacturing’s return in 2011. Walmart called him up after that came out to ask if he could help, and after several meetings to assure him that this wasn’t just about image, Sirkin came on as an adviser. Sam Walton couldn’t pull it off, but that shouldn’t count against Walmart, Sirkin thinks. Walmart has grown significantly since Walton died in 1992, and has a singular ability to move the market.